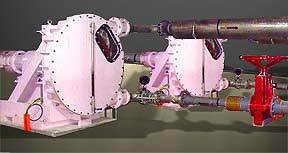 Halving the cost and tripling the performance, of staying "pulse free" in hose pump systems. The pipe turns the flow spikes into pressure spikes. The flow rate can not increase or decrease momentarily because the speed of rotation is constant. So the blip from the shoe or wheel mashing the hose, has to result in "back flow". (5) Flexorber LP is chosen where ease of flush through in place cleaning is enhanced by using LDI Flexflon, PTFE, or EIDP Teflon. And where the compatibility of PTFE diaphragms will increase life. Flexorber LP is an off the shelf inventory damper in the connection standard form. If you only wish to use once connection, save a "T" and use the other for system drain etc. (2) PipeHugger LP is chosen where you want an elastomer compatibility, plus in place flush through. Flow through is standard, a single connection is special, because even if you do not wish to use flow through, you can save a "T" for your RV or drain by using the second connection. PipeHugger LP is an off the inventory item with two connections. Single connection (3) PipeGuard flow fluctuation dampers are applicable where a 60% fall in pressure pulsation damping ability is not a concern. Stainless PipeGuards are less expensive than plastic pressure vessels and safer in the cold. (4) PipeHugger LP Lined with the same elastomer as the bladder is a cost saver where plastic would be dangerous and the compatible metal is expensive. * Only one small insert of special material, Tantalum, Zirconium etc. is necessary. (1) PumpGuard for systems 3" through 12" pipe connection. The flange face on the end of LND/Peg is also provided an FNPT thread. 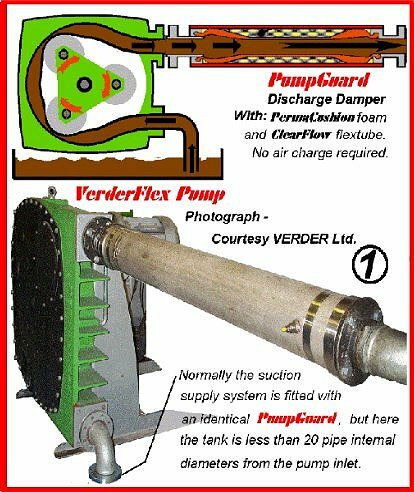 PUMPGUARD for perfect suction conditioning.